Plastic and snap ring retainers do not require tooling to install. They simply press on to the stud shank from the back side of the outer panel. Be advised that these types of retainers will not protect the panel hole from enlargement due to vibration etc. Z-Spec grommets are dual purpose. They protect the panel hole from wear and also act as a stud retaining mechanism. Flush Head studs use GF series grommets while Oval Head studs use GA series grommets. 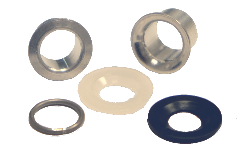 These grommets go through the outer panel only and it is recommended to use the shortest one possible that will fit the panel thickness. The grommet's wall thickness should be added in TMT calculations when determining stud length and spring height combinations. GA and GF aluminum grommets are flared into the panel using special tools that are required for installation (see tools page). If you have any questions or need technical assistance, please Contact Us for details, we will be glad to help. 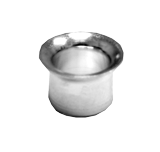 These aluminum grommets are used with AJ series, Oval Head studs. They protect the panel hole from enlarging and retain the stud in the panel when it is unlocked. 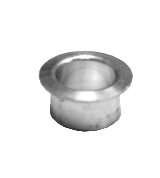 These aluminum grommets are used with FJ and FA series, Flush Head studs. They protect the panel hole from enlarging and retain the stud in the panel when it is unlocked. These simple retainers are pressed onto the stud's shank from the back side of the panel after the stud is put through the panel hole. These stianless rings are pressed onto the stud's shank from the back side of the panel after the stud is put through the panel hole.